How can I plug in the power adapter without shutting down? How can I edit the walk? Can I change more than one item at a time? How can I dynamically change configuration parameters? Wow, the ControllerGUI input field has a history? It crashed! Can I find out where it crashed? What events are available for my code to listen for? How do I make my behavior generate events? Do I really need to take the memory stick out? Can't I upload the new code? Does the AIBO work without a memory stick? Your memory stick's file system may have been corrupted, often by a crash while writing to the memory stick, or by pulling it out of the drive while its in use. Try deleting all the files on the stick, run Windows' "Scan Disk" or Linux/Mac's fsck.msdos to fix the format. Do not reformat -- this might delete hidden copy protection information, rendering the stick useless. Isn't DRM wonderful? If this problem recurrs, try a different brand of memory stick reader. Non-sony brand readers have been reported to not handle DRM-enabled (pink) memory sticks correctly, thus deleting the secret bits. We've had success with Dazzle and SmartDisk, but some limited (not permanent) trouble with SanDisk. Or be safe and spend 4x as much for a Sony drive. Yay DRM! Does the AIBO eventually make a growling noise? No: Double check you have the right TEKKOTSU_TARGET_MODEL setting in your project's Environment.conf file. Yes: Good! Boot sequence has completed. Read on. Are the LEDs flashing rhythmically? The Emergency Stop is on by default after boot. 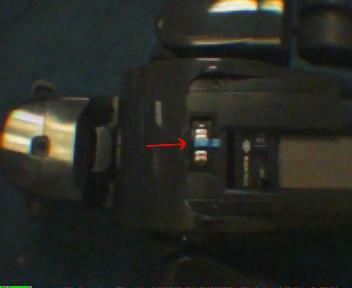 This is to prevent the robot from making any unexpected motions upon first booting up. To release the emergency stop, double tap the center back button, or press the "Go" button in the Controller GUI. The robot should bark. To freeze the robot again, either double tap the back button again, or press the "Stop" button in the Controller GUI. This time the robot will make a screeching sound. To permanently disable the startup in emergency stop feature, you will need to edit the StartupBehavior.cc file in your project directory. There's also a video and more information about the EStop. If all else fails, try a precompiled binary memory stick from the Downloads page. Interestingly, printf and cout seem to have separate buffers, so cout may die off, but printf's will still work. All you have to do is just connect to 59000 earlier on... the buffers aren't particularly small, so this doesn't happen very easily. Also, since port 59000 is buffered, if the Aibo crashes, you might not receive some of the last lines that were output because they hadn't been flushed yet. 3. How can I plug in the power adapter without shutting down? Once upon a time, you could plug the power adapter (shown at right) into your ERS-2xx series Aibo and it would continue running just fine. This is really handy when you're debugging communications type stuff and all the Aibo is doing is just sitting there. Not only does it keep the battery from draining, but it will recharge the battery while running. You can also swap batteries if you don't want to lose whatever's in memory, but want to run untethered again afterward. Unfortunately, recent versions of the SDK will force a shutdown whenever external power is connected, which overrides our own software. To get around this, you need to put a piece of tape over one of the connectors of the power socket. This will allow power to flow, but prevents the Aibo from shutting down. Take heed, however, that I don't know if there's a good reason why Sony decided to force a shutdown on power connection, and I don't really know what the full purpose of that connector is, so I don't know what side effects it may have. If you know the answers to either of these, feel free to let us know. On the up side, we've been using this trick for many months now without a hitch. Also, make sure the round connector that goes into the head of the power adapter is pushed in snug - ours has a tendancy to pull out a little and disconnect without appearing so. The newest OPEN-R SDK (1.1.5) contains a feature called "Jam Detection High Threshold". If you are finding that the jam detection routine is too sensitive, you can make it less strict by creating the file "/OPEN-R/SYSTEM/CONF/VRCOMM.CFG" and writing a single line, "JamDetectionHighThreshold" in the file. This only works with ERS-7. Commonly, most networks hand out IP addresses dynamically through a protocol known as Dynamic Host Configuration Protocol (DHCP). That's great, except when you're trying to use a robot which doesn't have a built in text display to show its current IP address. In the long run, the easiest way is to fix this is to assign an address yourself -- most wireless access points (WAPs) can be configured to hand out a pre-determined IP address to a specified MAC address, which is printed on the underside of your AIBO. (for ERS-7 models; the 2xx series have it printed on the wireless card that is plugged into the interior slot) Of course, each WAP manufacturer has its own configuration interface, so you'll have to consult your manual for help with this. To trigger the report, turn off the e-stop (double-tap the back button), and then press and hold the chin and head buttons for two seconds. 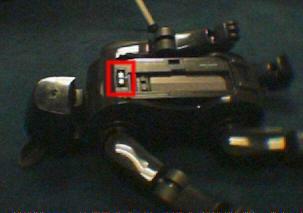 The AIBO will then begin speaking the IP address, and will flash the numbers on its LEDs as well. If you are going to be working in a dynamic environment, you will probably want to customize the flash_on_start and flash_bytes configuration parameters of <project>/ms/config/tekkotsu.cfg, which will the automatically report the IP address at boot and only report the variable part of the address (most of the time, all addresses within a network will share a common prefix). First use the 'ping' command line utility to try to contact the Aibo using its IP address as given in the previous item. If that fails, there is a configuration problem in the network, either with a firewall or bad ms/open-r/system/conf/wlandflt.txt settings. If the Aibo's IP address starts with 169, it is a self-assigned address and indicates that it was unable to contact a DHCP server, possibly because it was unable to join the wireless network. If ping works, but some other functionality does not, check your firewall settings. The camera streams can use either UDP or TCP transport, but by default use UDP for better performance. Some firewalls are more restrictive of UDP usage. All other included network code uses TCP as its transport. You'll need to close the ControllerGUI window for it to save the preferences. Killing its process will lose changes made to preferences. 4. How can I edit the walk? Can I change more than one item at a time? Within the Walk Edit menu, when you select one of the value controls (say for instance, "Slow Motion") type a value into the input field and hit enter. The value will be set to what you typed. Now get this: if you select more than one item (hold down the control or shift keys) and then you enter a value, you'll update the whole set of items at once! 5. How can I dynamically change configuration parameters? You can use the '!set' command at the ControllerGUI input field or the Tekkotsu console to change any item listed in the config file. This is handy for items that don't have a GUI to control them. However, some objects only check the config parameters when they are initialized, and so must be restarted for the changes to take effect. This can be done automatically, see DynamicConfig. 6. Wow, the ControllerGUI input field has a history? 1. It crashed! Can I find out where it crashed? After the Aibo finishes beeping and shuts off, remove the memstick and put it in your drive. There are several options which you can pass to crashDebug to streamline the output or get extended information if the stack has been corrupted (by, say, a buffer overrun). Pass -h to crashDebug to get usage information. If you are getting confusing or incomplete results, you may wish to try turning off some of the compiler optimizations. In the project's Makefile, try removing the -O2, -frename-registers, and -fomit-frame-pointer flags from the CXXFLAGS variable. Stack traces provided by Mi-Pal tools from Griffith University. Thanks! 2. What events are available for my code to listen for? The enum EventGeneratorID_t holds all of the generator IDs. This is contained in the EventBase class. Thus, for example, the vision generator is EventBase::visionEGID. 3. How do I make my behavior generate events? These functions are defined in EventRouter - you can read more about them there. However, if you want to create a new generator, you will need to modify Events/EventBase.h and Events/EventBase.cc. The modifications are easy however - simply add a new entry in EventGeneratorID_t and give it a corresponding name in EventGeneratorNames. Once the new generator has an ID number and name, you can use it however you like. You're in luck! Alok Ladsariya (alokl at andrew dot cmu dot edu) happened to write a script to distribute computational tasks over a set of machines for doing a project for one of his classes, and he has donated the script to us. This is a fairly advanced topic, and requires some solid understanding of Linux features. Copy tools/dist_hosts.txt to your project directory. Modify the hosts shown in this example file to correspond to your local machines. Priority corresponds to the 'nice' level (if these are your dedicated machines, probably shouldn't be so nice. The default, 17, is pretty nice - suitable for shared machines) If the Force column is zero, the machine's load will be checked before each job to make sure it's not running a process for someone else at high load. You shouldn't force if you're nice - you might not get very many cycles and it'll take longer overall to finish because everything is waiting on that one job. The user node won't be given jobs to do (other than managing the cluster nodes) unless you explicitly list it in the dist_hosts.txt file. The setting for TEKKOTSU_ROOT and OPENRSDK_ROOT on the user node must correspond to the appropriate locations on the cluster machines as well... the same path is going to be used for execution of binaries regardless of which machine the command is being sent to. User node creates <project>/build/joblist.txt, which contains compilation commands for each source file which needs to be compiled. User node then farms out joblist.txt to cluster machines - each machine gets one line from the file to execute. User node links together object files, produces executable in <project>/ms. Remember that a clean compile has to build all of the Java tools, so there's more significant overhead than is found in the other two. Also, since the user node has to do all the linking, there's still significant overhead involved even with a small modification - when only two source files need to be recompiled, only a few seconds are saved. However, these tests were done on shared machines with high 'nice' and no forcing. If you have dedicated lab machines, you can probably get more of a speedup than shown here. 5. Do I really need to take the memory stick out? Can't I just upload the new code?